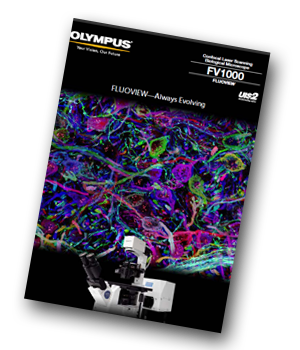 Olympus presents its brochure highlighting the FLUOVIEW FV1000 that features simultaneous laser-light stimulation and imaging by incorporating two laser scanners in a single compact design. This confocal laser scanning microscope delivers efficient and reliable performance together with the high resolution required for multi-dimensional observation of cell and tissue morphology, and precise molecular localization. It incorporates the industry’s first dedicated laser-light stimulation scanner to achieve simultaneous targeted laser stimulation and imaging for real-time visualization of rapid cell responses. Furthermore, it measures diffusion coefficients of intracellular molecules, quantifying molecular kinetics. Two types of detectors deliver enhanced accuracy and sensitivity, and are paired with a new objective with low chromatic aberration, to deliver even better precision for colocalization analysis. These optical advances boost the overall system capabilities and raise performance to a new level. The FLUOVIEW FV1000 is capable of measuring the diffusion coefficients of intracellular molecules, for quantification of the dynamic interactions of molecules inside live cell. It's also an upgradeable system with optional hardware and software to meet the varying demands of research. and concentrations by calculating the diffusion coefficients of molecules within the cell. Diverse analysis methods (Raster image correlation spectroscopy / cross-correlation raster image correlation spectroscopy (RICS/ccRICS), point scan fluorescence correlation spectroscopy / point scan fluorescence cross-correlation spectroscopy and fluorescence recovery after photobleaching (point FCS/point FCCS and FRAP) cover a wide range of molecular sizes and speeds.